Review: As a mysterious planet hurls itself toward earth, an extraterrestrial arrives on a remote Scottish island with unknown intentions. Is this mysterious being friendly? Does it mean us harm? Can scientists, a reporter, and the terrified villagers find out before it's too late? The Man from Planet X is one of those late-night scif-fi flicks that ran endlessly on television back in the day. After only having seen bits and pieces of it, I finally sat down to watched it, soup to nuts. And my analysis...it's a fun, odd little movie. The alien is a rather interesting looking creation. With an oversized fishbowl surrounding the original Mr. Potato Head-esqe noggin, and the almost robotic body movement, you really don't know if this strange visitor is "friend" or "foe". Robert Clarke is reliable as the lead hero, but it's William Schallert as the shady Dr. Mears that really steals the show. He's more of a villain here than the expressionless spaceman. 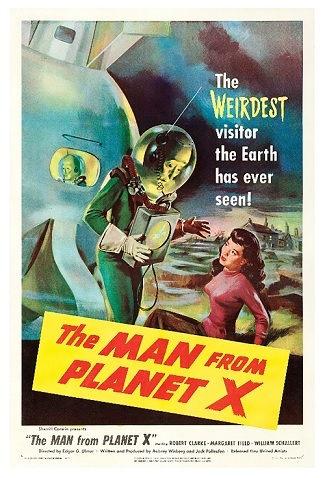 Made for a whopping $41,000, and shot in 6 days, The Man from Planet X has cult classic written all over it. It's silly at times, but then it has its moments of mystery and suspense that leads to an explosive climax that may just save worlds from colliding. Fun Fact: Although SAG minimum was $175 per week, Robert Clarke's pay was $175 for the entire film. His final check was $210 with overtime.